When I first saw the sign for Backyard Cinema’s winter ‘Labyrinth’ experience, I thought the only film they were showing throughout the Christmas period was the one starring David Bowie. You know; the one with the goblins and the sister crying over why she banished her baby sister to a weird alternative land. Naturally, I thought this was a rogue choice. But, rest assured, it’s just a description for the lovely wonders in store. And alongside that, there are your festive favourites like Home Alone, Elf, Love Actually and, as I had the pleasure of seeing, The Holiday. 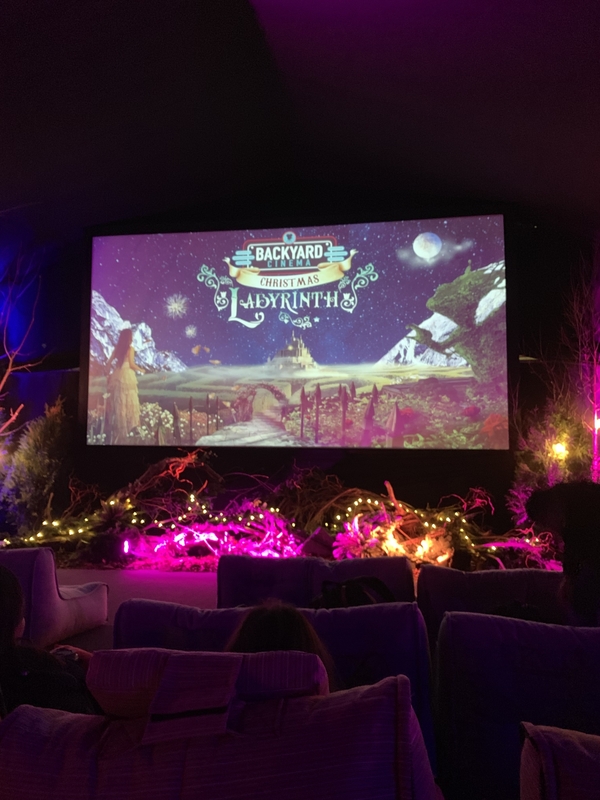 This Christmas, Backyard Cinema have based themselves in Clapham Common’s Winterville. If you’re not familiar with it, think of a less hectic Winter Wonderland with more heart and better food. Basically, it was the perfect location. I was terrified the film would be hard to watch – imagining my sister and I would be freezing our boots off in a field somewhere. How wrong I was. The Labyrinth experience is tucked nicely inside Winterville. It’s definitely not a field with seats. It’s a magical tent with mazes, decorations and friendly staff. I was expecting to fight for a seat and nestle down. Bish bash bosh. Like you’d do at a cinema; get in, watch it, get out. But it was so much more than that. The introduction felt like something out Narnia. And when we made it through to the cinema, Hannah and I were given cosy seats complete with blankets and a beautifully-decked screen. (Seriously, I could have lived in there). The Holiday, as ever, was delightful. It was a novelty seeing it on the big screen. After all, it’s one of those movies that’s always positioned on a DVD shelf somewhere; whipped out at Christmas or times when you need a pick-me-up. Maybe it’s for a laugh or a cry. Perhaps you want to feel all romantic or be inspired to take a risk. It’ll help you through like a trusty friend. But usually, it’s on in the background while you’re snuggled under a duvet on the sofa with your friends, bickering over the last mince pie and frantically trying to wrap a present. This experience meant I paid far more attention to the movie. And I realised I’d been missing all kinds of things. Like how Jude Law’s gorgeous Graham was a book editor and his mum worked for Random House. Cameron Diaz’s character, Amanda, talks about her parents’ divorce and how they used to call themselves ‘The Three Musketeers’ when she was growing up. Only for Graham to later make that reference with his kids, the ever-so-cute Sophie and Olivia. My sister said she had never even watched the end – when they’re dancing about on New Year’s Eve (the best). So sometimes it takes a special moment or event like Backyard Cinema’s Christmas Experience to open your eyes. To get cosy, to remind yourself of some important life lessons, to alleviate some stress, to have fun and most importantly of all – to bring loved ones together. Thank you Backyard Cinema – you’re wonderful. So are you, sis.